LAS VEGAS — Jock Landale had 22 points and 10 rebounds, and No. 19 Saint Mary’s never trailed in an 81-50 victory over BYU on Monday night in the West Coast Conference semifinals. Calvin Hermanson added 14 points and Emmett Naar had 12 points and 11 assists for the Gaels (28-3), who hit 13 3-pointers and earned a third chance to play nemesis Gonzaga in the title game Tuesday. The fourth-ranked Bulldogs, who beat Saint Mary’s twice in the regular season, held off Santa Clara 77-68 in the first semifinal. T.J. Haws scored 13 points for the cold-shooting Cougars (22-11), who handed Gonzaga its only loss but faces long odds to reach the NCAA Tournament. With third-seeded BYU missing 22 of 32 first-half shots, second-seeded Saint Mary’s raced to a 36-20 lead. Hermanson then hit a 3-pointer as the Gaels scored the first five points in the second half, and they led by as many as 35 points in their sixth straight win. BYU’s Eric Mika was held to 10 points on 5-of-13 shooting after scoring 25 in Saturday’s quarterfinal win over Loyola Marymount. BYU shot 32 percent from the field in bowing out in the WCC semifinals for the second straight year after reaching the final in 2014 and 2015. It was another efficient offensive outing for Saint Mary’s. Landale hit 8 of 12 shots from the field and all eight free throws while securing his 15th double-double of the season. The Gaels shot 56 percent from the field and went 13 of 25 from 3-point range. Saint Mary’s coach Randy Bennett rested most of his regulars over the final 5 minutes ahead of Tuesday’s championship game. The Gaels lost at Gonzaga 79-56 on Jan. 14 and 74-64 at home to the Zags on Feb. 11. BYU: The Cougars eclipsed 20 wins for the 12th straight season, but an RPI of 63 entering the game hurts their NCAA hopes despite the stunning win at Gonzaga on Feb. 25. BYU has losses to Utah Valley (210 RPI) and San Diego (203). Saint Mary’s: The Gaels came to Las Vegas with one goal: get another crack at Gonzaga. The only other team they lost to was Texas-Arlington on Dec. 8. 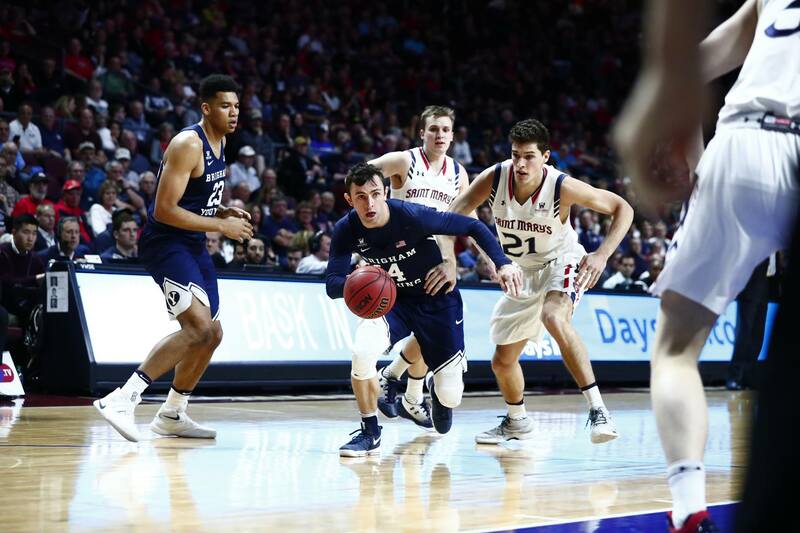 BYU: The Cougars will await their postseason fate amid optimism for a team that didn’t start a senior over their final eight games. BYU has played in the postseason 11 straight years. Saint Mary’s: Beating Gonzaga on Tuesday night would give the Gaels their first WCC title since 2012.